Years ago, Warner Bros. made an unfortunate error when they began their DC Extended Universe. They were trying so hard to duplicate past success. After the massive success of Christopher Nolan’s The Dark Knight trilogy, they went “Huh…maybe we should apply the ‘semi-realistic’ take to Superman”. And so Man of Steel happened in 2013 under the direction of Zack Snyder, a dead pan serious take on the commonly idealistic hero. It was 2 and a half hours of miserable existence and the titular character just lacked an kind of heroic personality. After the follow-up, Batman v Superman: Dawn of Justice (What was wrong with simply World’s Finest exactly?). In trying to copy Marvel’s then-blooming shared cinematic universe they forgot the one crucial element to their success. Creating a distinct understanding and tone of each character. Whereas Warner Bros. decided to make every hero a brooding mess, Marvel made sure to have each character express a distinct personality and embracing the source material for the most part. As a result, Warner Bros. ended up trying to course correct, first by reshooting much of Snyder’s Justice League and making it lighter in tone (Leading to a tonally disastrous Avengers rip-off). That didn’t go as planned with JL barely breaking even at the box office with $600 million on a rumored $300 million budget. But then WB started actually letting their directors express their own tones instead of micro-managing like they did with Snyder’s films. The first sign of success was Wonder Woman (Which came out before Justice League) which was critically praised and a box office success. Then, Aquaman came out post-JL, turning out to be an entertaining and visually stunning piece of blockbuster cinema (See our review here). That film went on to be the first DCEU film to gross over $1 billion at the box office. Now, WB seems to have outdone itself with their next DC film Shazam! which not only is entertaining to a fault, but is genuinely heartfelt at times, embracing it’s cheesy premise with gusto. Gusto that sometimes makes you laugh and other times cry. In any scenario, the premise of a young boy given the power to become a superhero adult, courtesy of a wizard by the way, would come off as bad Saturday morning television. 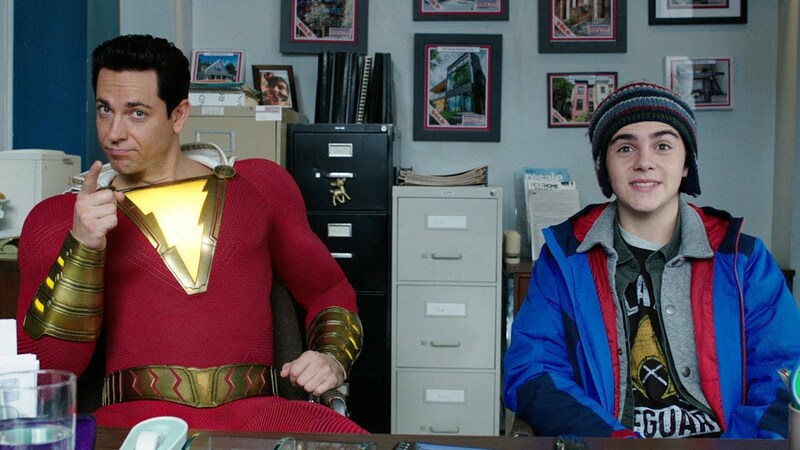 Heck, casting Chuck star Zachary Levi to play the adult version of Billy Batson (Played by Asher Angel in his teenage form) would seem to indicate that’s exactly what would happen. What director David F. Sandberg realizes is that is the key to making Shazam! work, pointing out whenever they can the ridiculous aspirations of heroism in the comic books through juxtaposition to the real world struggles Billy deals with (An orphan who bounces from one foster home to the next as he searches for his mother). This of course is courtesy of Billy’s new foster brother/best friend Frederick “Freddy” Freeman (Played by Jack Dylan Grazer) whose superhero obsession comes in handy once Billy inherits his powers. That friendship ultimately helps carry the film as Billy tries to understand his powers and the responsibility associated with them. Levi and Grazer’s friendship serves as the heart of this movie for good reason. It helps too the relatability of Billy, a young man who has had little control of his destiny who is suddenly given all the power in the world to do whatever he wants and Freddy’s countering personality of cynicism. Together, wisdom grows and themes begin to take shape. The film is most definitely a superhero film, but yet the best movie comparison I can give to it would be the 2003 holiday film Elf. A similar story where reality meets fantasy and myth. It would be insulting to say the film’s talent is simply making you believe in the impossible. It’s a film about making you believe in yourself, something made obscenely clear by the end as Billy learns to appreciate who he is. And who he has in his life. It’s been awhile since we’ve been allowed to get an old-fashion, pathos driven superhero tale. The first set of Spider-Man films did, but after that it became increasingly about the spectacle than the emotional drive of the hero, in my book a requirement of such coming-of-age tales. Shazam! delivers while letting the large cast of orphans, heroes, wizards, and villains alike clash dynamically in every arena from teenage angst to adult responsibilities. It’s in that latter point another juxtaposition is made through the comparison between the backstories/motivations of hero Shazam and the villain of the story Dr. Thaddeus Sivana (Played by Mark Strong). Strong has been in a couple superhero films, but the biggest disappointment was how wasted he was as Sinestro in the critically hated film Green Lantern. While perfect for the part, he was never given a chance to shine. Yet here, he gets a chance to finally be the fear-driving villain he was always meant to be, played with both bitterness and internal revelation in a way that works well off the more fun-loving lead hero. Strong is finally the superhero villain he was always meant to be! But of course, no superhero film would be complete without the spectacle I mentioned earlier, except here Sandberg stages the action in an almost intentionally back-and-forth comedic switch between comedically juvenile and maturely brutal (With cinematographer Maxime Alexandre realizing it and editor Michel Aller matching it). Through the action scenes, and as a whole, the film at times almost feels like an unintentional (Or maybe intentional?) satire of the self-seriousness that Man of Steel was all those years ago. Except this time it’s the villain trying to smash the hero into buildings full of innocent people. Shazam! is a lot of things and while it may sometimes have trouble balancing it’s massive flow of ideas, humor, and character development (Several scenes could have been done without), it’s a film on-par with Aquaman (Possibly better!). A story of classic heroism and a fun mythology that let’s itself run free with a spectrum of emotions. Warner Bros. may have started the DCEU off like a trainwreck, but with films like Aquaman and Shazam!…they seem to finally be getting back on track. Themes and thematic parody of earlier, serious DC films. Several unnecessary scenes stretch out the film’s otherwise strong pacing.